I love coffee and am very particular about having good coffee, properly brewed. Arch is also fussy about his coffee, but not so much as I am. After all, I was once a coffee roaster and my taste buds are trained to recognize the nuances in flavours between the different coffee beans. As a result, I spend a lot of money buying good coffee and brewing it properly. I've tried a lot of coffee brewers along the way. Everything from a Bodum (good if you like grounds in your coffee) to the new capsule brewers. At our old house we used the home version of the restaurant-style pour-over coffee brewer. I loved it - it was fast, easy and made excellent coffee. But way too big to use in the Adventure Bus. After looking at a lot of coffee makers I settled on an old-fashioned, but electric, coffee peculator. It was time, I thought, to sacrifice a little quality for more space in our tiny kitchen. And, guess what? We love it too! It is easy to clean, does not take up too much counter space and stores in a corner of the cupboard when not in use. And, much to our surprise, makes the best coffee ever! And uses half as much coffee as other brewers. A real money saver it this home as we drink a lot of coffee. I think it uses less coffee because the water is in contact with the grounds longer as it perks through. 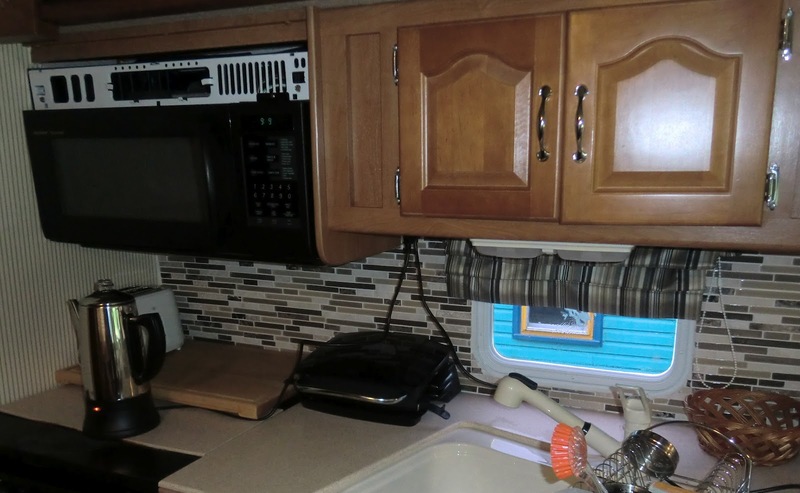 Whatever the reason, this is one old-style appliance that has won a spot in the Adventure Bus. Well, here we are. Moved in and somewhat organized. The Adventure Bus is very comfortable and we are really pleased with the changes we made. I am still paring down our possessions. You get mighty tough about getting rid of something about the third time it gets in the way. Tara is settled in and happy. Any place that Arch is is good enough for her. Princess is doing much better than we expected. Sometimes I think cats would rather change people than change houses so we are relieved that she is settling in so well. When she came to live with us she spent the first 2 months under the spare bed. So we were a bit worried, but she spent one day trying to find a place to hide then gave up. Now she has claimed our bed as her turf and shares with no-one during the day. Much to Tara's disgust and disappointment. 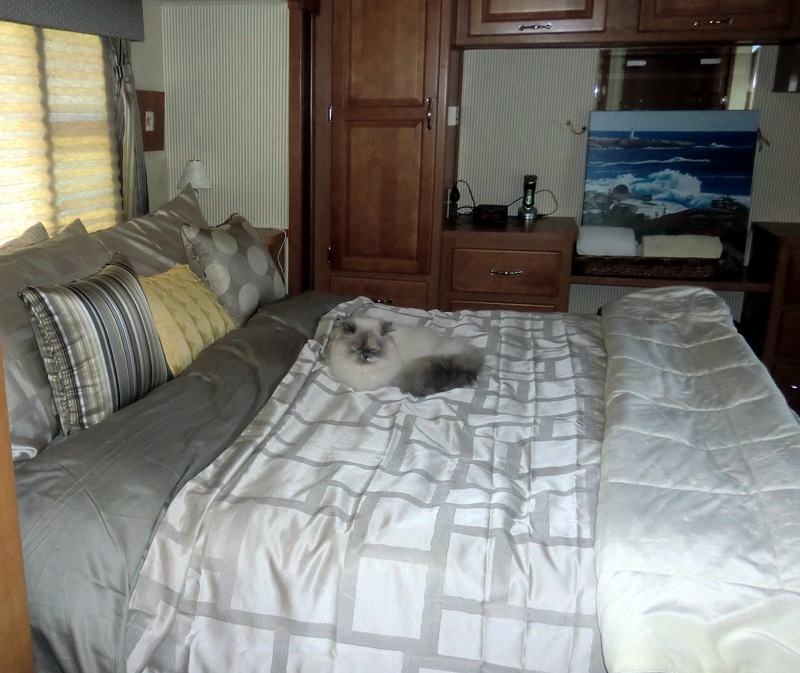 One of the RV bloggers we follow is Nina from http://wheelingit.wordpress.com, She recently wrote a post explaining the 80/100/100 rule of RVers - if 80% of the things on the motorhome are working, we should be 100% happy 100% of the time . We are quickly learning that this true. We thought everything was perfect when we moved in but now the kitchen tap is leaking. And the freezer is icing up - I think that is because it was on and empty so I am defrosting it. And Arch is getting a new tap this am so we will be back to 100% working. Briefly, I expect. Having the telephone on the dining table is not great. We have not figured out a cure for this. Also, note the location of this plug. 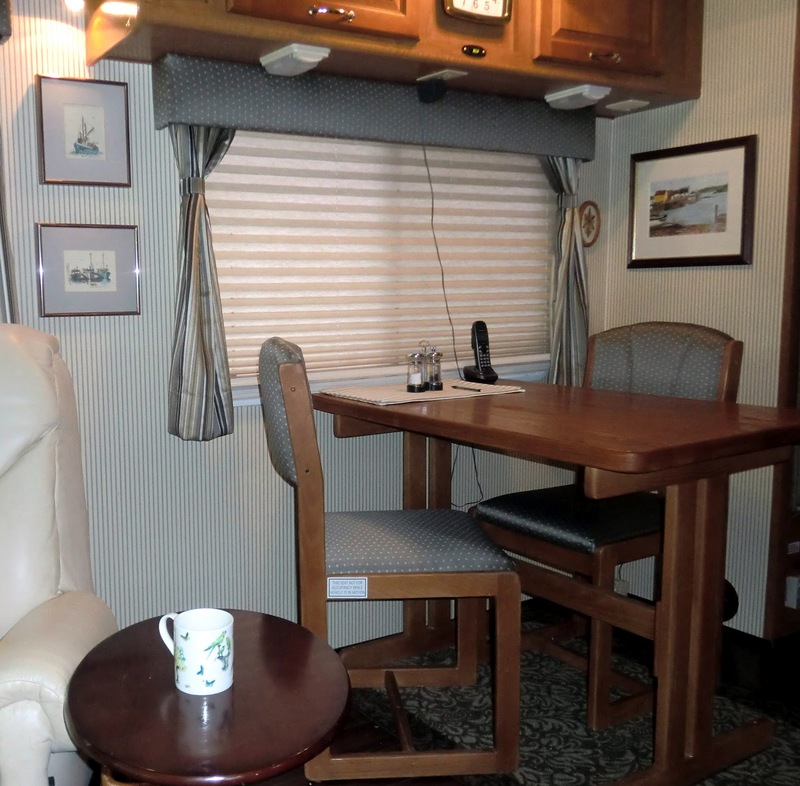 They are the only two in the living area of the motorhome and must be used for kitchen appliances, laptops. etc. 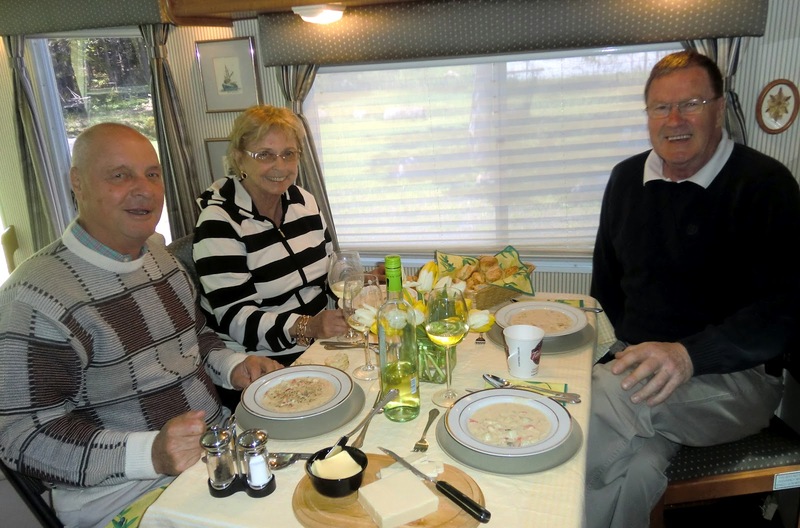 I guess there is really no way to put them in the walls of the motorhome as they are too thin. As one of the manufacturer's reps. at the RV Show said "its just a box on wheels you know". Labels: Class A Motor Home, Damon Intruder, Halifax, Nova Scotia, Pets and rving. 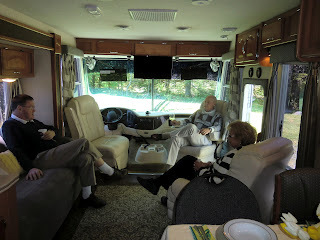 Well, here we are, at home in the Adventure Bus. All in all the move-in went well. The only real glitch was with the great deal we got on the memory foam mattress. It turned out to be a not so great deal after all. Mainly because the manufacturer - NasaFoam - failed to deliver as promised. The deal on Groupon looked great. A $2100 mattress for $699 - what a saving. Who could resist. So I ordered it. The order procedure seemed strange. No "thank you for your order" note. No receipt. No anything. That made me nervous. So after three weeks I called the company. Someone answered the phone with "hello". No company name at all. That made me more nervous. I said I was calling to enquire about an order I placed. "They don't deal directly with the public" the voice said. "but you have a link on your website to redeem my Groupon" I said "Oh" said the voice "Well, where do you live?" "Halifax. Nova Scotia" "Halifax, where's that?" Now, that made me really nervous. The conversation ended with a promise that the shipper would call me with a delivery date by "the end of the week". The end of the week came and no call. So I called again. The voice said "I will look into it and get right back to you" Then no call. After another week I called again. The voice was starting to get abrupt and rude. So I hung up and emailed Groupon. After two responses saying there was nothing they could do because it was an internet order I wrote asking for a refund. One day later we got a note from NasaFoam asking for payment for shipping. Hurrah! Finally some action! I paid it immediately with Paypal. As you likely know Paypal guarantees they will refund your money if there is a problem. We use Paypal for Bay Hammocks on-line payments and know their system - they hold back 15% of each order for 90 days in case they need to refund someone's money. We waited another week and still no mattress. Arch then called NasaFoam and talked to the voice. By now we know his name is John. After some discussion he learned that the mattress was supposed to be shipped by a freight forwarding company and they (Nasafoam) had no control over the shipping date. So Arch asked for a bill of lading #. John said there was no such thing. Now, Arch used to work for Ford Motor Company in material handling so he knows - there is always a bill of lading. After some discussion Arch got the name and a phone # for the supposed shipping/freight-forwarding company - Can Move. He called Can Move. Again, the phone was answered with "hello" and the addition of a lot of laughter in the background (are you starting to get suspicious?? we sure were!). After a short but heated discussion he hung up and called John back. If you know Arch, you know he is not the most gracious person in the world when he is angry. This conversation ended with John cancelling the order. I immediately emailed Groupon asking for a refund, which I received within 24 hours. By the time I got to Paypal our payment for shipping had been refunded - by John I suppose. Nasafoam has a very fancy website and looks like a real and successful company, but I guess looks can be deceiving. Can Move appears to be non-existent. Here is the BBBs listing for them. We have no gripe with Groupon. We use them frequently and this was our first difficult experience. However, I do feel they should vent the companies they do business with a little better. And their complaint procedure could be more efficient. After all this, we then got on the phone and found a company, right here in Halifax, Comfort Foam and Fibre, that custom cuts and makes foam mattresses to size. Very nice people. We got exactly what we needed within two days. It is not memory foam, but but it is extremely comfortable and cost only $800 tax included. The moral of the story: SHOP LOCAL whenever you can. So here we are all moved in and very comfortable. I will write more about our first days in our new digs tomorrow. For now, here is Princess enjoying the new bed. One of the things that I wonder about a lot is how we will live in the Adventure Bus. Lots of full-time RVers write blogs about what they do and where they have been or are going, but no one posts about how they live day to day. And very few show pictures of the inside of their RV. Also not much about how they cook or what they eat. Lots of posts about RV systems though so that is helpful. One of the big questions is how we will entertain friends. Especially here on the Atlantic coast of Nova Scotia where the weather is unpredictable and sitting and eating outside is not something we can count on. So when old friends "from away" (as we say here) came for lunch a week or so ago it was a big test. The ability to turn the two driving area chairs around created a cozy and very functional livingroom. I made lobster and scallop chowder (recipe follows) and cheddar and chive tea biscuits for lunch. Served with some good cheddar and strawberry-rhubarb pie (from Delish, a local deli) and white wine it was a simple but delicious lunch. I even had space on the table for a bouquet of tulips. It was snug but we managed quite nicely. Any more that 4 and I would serve buffet-style. 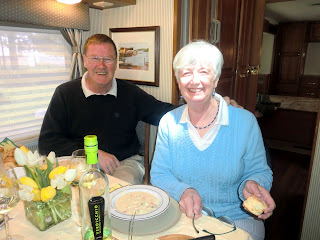 With the kitchen so close at hand it was easy for Arch and I to sit and enjoy our company and still keep track of what was on the stove. And it was great to catch up with old friends. Thanks Gil and Joyce for being such great guinea pigs. You set the bar high for our next guests. We are about two weeks away from moving in to the Adventure Bus. As you can see if you look behind us in the last picture our new mattress is still not here. We are starting to get a little impatient with this situation. The people at Nasafoam Mattresses in Toronto are being unresponsive and at times simple lying about when we can expect delivery. We will give them another week, then ask Groupon to refund our money. 2. Prepare the leek soup as directed and add cooked potatoes and onion. Add seafood. 3. Dice the Velveeta and add to pot along with the cream. Add salt and pepper to taste. 4. Heat through, stirring frequently, until the cheese is melted. Do not boil. Garnish with paprika and chives and serve. * In Nova Scotia we can buy cooked fresh lobster at a couple of speciality fish stores. You can use frozen or substitute the fish of your choice. 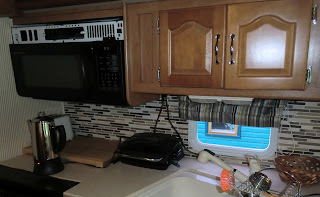 Labels: Class A Motor Home, Damon Intruder, Food, full time RVers, Halifax, Lobster, mattress for motorhome, Nova Scotia, seafood chowder recipe.